Do you love the Marvel Cinematic Universe enough to do a 31-hour marathon leading up to Infinity War? If you're a die-hard Marvel fan who has the endurance for such a thing, AMC Theaters has you covered. 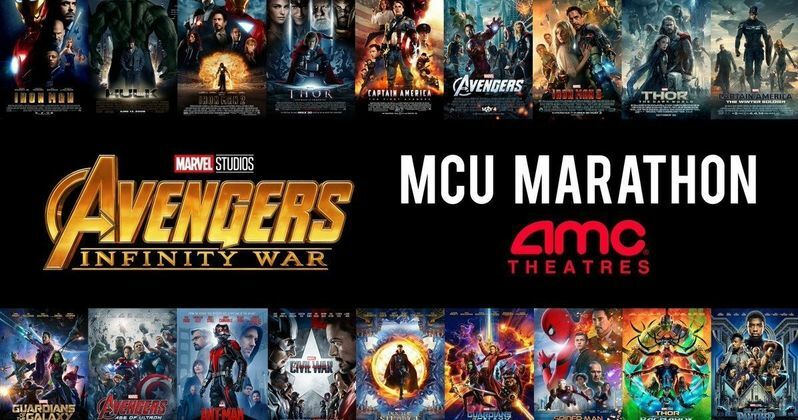 Leading up to the release of Marvel's upcoming massive event, the theater chain is planning a massive marathon of nearly every MCU movie in honor of Infinity War arriving in theaters. You can take the entire decade-long journey and roll right into what is arguably the biggest movie of the year. Details on the event are currently a bit scarce. AMC just has a page for the event on their website, but few actual details about what fans can expect. Those details will likely be revealed once tickets for Avengers: Infinity War actually go on sale, which is rumored to be happening this Friday. With that in mind, if you want to actually participate in this massive MCU marathon, you'll want to keep an eye out for tickets to the event, as demand will likely be high and they're sure to sell out quite fast. Infinity War isn't just going to be another big hit for Marvel, this is an event the likes of which we've really never seen. One big question right now is exactly how this marathon is going to be structured and what exactly is going to be included. The MCU marathon is listed for 31 hours, but counting Black Panther, watching all of the movies in the MCU would take more than 38 hours. That means that a couple of movies may be left off. Or perhaps AMC is going to find a way to trim some things down and condense some stuff down in order to show all of the movies, but maybe truncated versions in some cases. That's purely speculative, but could be one way to go about it. Assuming that AMC will go the easy route and just leave out a few movies from this MCU marathon, what movies won't make the cut? The most obvious choice would be The Incredible Hulk, which features Edward Norton as Bruce Banner and the movie really doesn't have many ties to the overall MCU anymore. It could go pretty easily. Beyond that, things get more tricky. Spider-Man: Homecoming could also be a possibility. Not because fans don't want to see more of Tom Holland as Peter Parker, but because the movie is a partnership with Sony. Homecoming also doesn't have any huge ties to the Infinity War build-up. Another option would be Thor: The Dark World, as it's generally regarded as the worst of the Marvel movies. If you've gotta trim the fat, that's the fattiest of fat in this universe. Marvel recently moved the release date for Avengers: Infinity War up by one week to April 27. That means we should be getting a new trailer any day now and tickets will be going on sale very soon. Even if you don't have the endurance for a 31-hour marathon, you'll want to get tickets for the early showings quickly, so keep an eye out. Those who do want to do the MCU marathon, be sure to keep an eye on AMC Theaters' website.